Whether you like to show your patriotism on special occasions or all year round, this American Fan Flag helps you do it in style. An all-American red, white and blue striped design with white stars showcases your USA pride with class and charm. 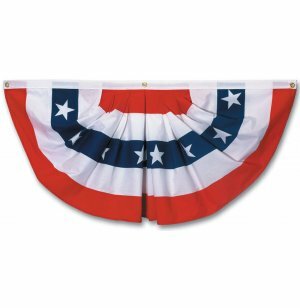 Great features make this American Fan Flag exceptionally convenient. It comes ready to hang and includes brass grommets. 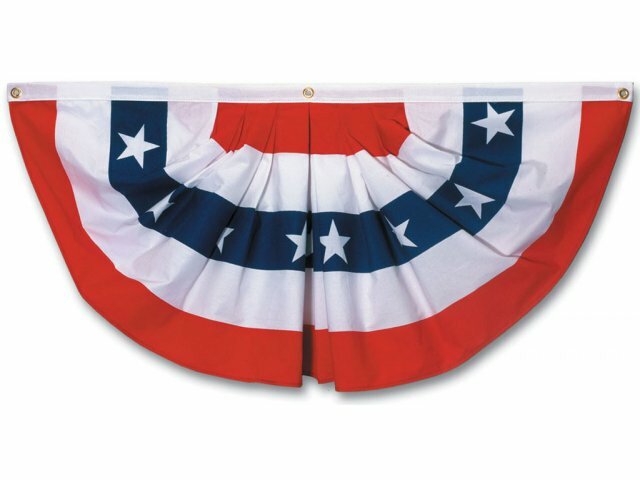 All you need to do to get your fan flag hanging prominently is tie it up in your location of choice using the grommet holes. When hanging is so easy, you can rearrange or hang additional fan flags as often as you like. Aesthetic Appeal: Red, white and blue stripes and white stars have a classy, patriotic look. Elegant Arrangement: Pleated printed polycotton looks great in any location. No Hassle: Brass grommets make hanging and arranging as easy as possible.